've been feeling sort of old-fashioned lately, listening to plenty of roots music and lots of radio. I like radio as a form of entertainment, not just something in the car that gets you from A to B. 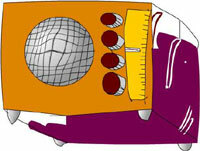 Not that I don't do a lot of radio-listening while driving, lacking all but a radio in my bucket of bolts. 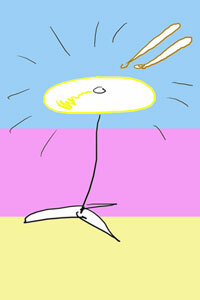 Radio at home: a religious experience. Radio is good at home, too. The content is certainly less banal than Fox's newest reality series. Try listening to basketball or baseball some day. You'll feel the years roll back as your imagination starts up. But now the days of each month fall like dominos on the calendar page, and things change. So on May 15 at about 12:42 a.m., KBOO's Church of Northwest Music, the premier live music radio show for Northwest musicians, clicked off after 25 years with a brief, tinny squelch. The Church passed through the hands of a few hosts before landing in Marc Baker's lap at the start of the '90s, and for the last 13 years he presided over joyful noise made by bands hailing mostly from Portland and the Northwest, though national and international acts squeaked through on occasion  even, according to Baker, from as far as Northwest Tokyo, Japan. Baker's farewell lap on the airwaves included lots of humor, both good and sardonic, with barely an echo of wistfulness or bitterness and plenty of highlights from his extensive archives of the show. Delightfully, in each song the sound quality and performances (mostly) are so crystal clear and tight as to totally belie their live-music-on-radio origins. It's a testament to Baker and his compatriots: Brother Jay, Datmaster Eric and Harry and Barry. Church bulletin: Volume One is worth snapping up. From Kaitlyn Ni Donovan's lush, funky and naively nerdy opening clip to the wretched version of "My Sharona," a Satyricon-recorded salute to Baker that concluded the sermon, a range of style and talent was put on the air in a fast-fading format. Fernando wailed en español, shaking the neighborhood with his talent-heavy band (Warren Pash, Luther Russell ...) and So Sadly F**cked lived up to the name with a rainy-day singer/songwriter whisper. Little Sue sang a sweet tune with elfin guile and Rick Bain and the Genius Position muffed the start of some smart '70s pop-rock (who said live radio was easy?). Baker, intelligent, passionate and irreverent about music, took the time to touch on other musical institutions in Stumptown that have met similar fates as the Church, such as the recently-sold/closed-fate-unknown Satyricon and Bill Fisher's legendary practice-studio paradise, the Palace, where now a Pearl District condo and a Starbucks stand. Live to tell: the premier live music radio show for Northwest musicians ends. What it boils down to, as distilled by Baker, is that purported cliché, "community." You could hear it in the obvious fun Baker had with his crew and the flawless glee in each recorded-live performance. The sense of community the show fostered will definitely be missed. Nonetheless, KBOO has deemed it appropriate to suddenly axe the Church, and any contention is in the minds of the KBOO Board of Directors. 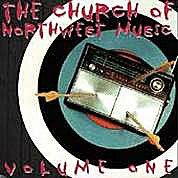 You can probably still find copies of the Church of Northwest Music Volume 1 CD here and there, and they're worth snapping up, because the Church is closed and we're moving on.